AMSAT OSCAR-E wurde am 28.06.2004 erfolgreich mit einer Dnepr-1 Rakete vom Baikonour Kosmodrome in Kasachstan gestartet. Der erste Konakt fand um 1452UTC statt und es wurden erste wichtige Telemetriedaten gesendet. Die Batterien waren voll geladen und die Solarpaneele lieferten genügend Strom. In den nächsten Tagen wurde die Software geladen und die Telemetrie zeigte gute Werte an. Der 25 cm große Würfel wiegt etwa 10kg. AO-51 besitzt 4 VHF Empfänger und 2 UHF-Sender, einen Multi-Mode Receiver und einen 2,4 GHz Sender. Er umkreist die Erde auf einem 850km hohen, sonnensyncronen Orbit. Die Inklination beträgt 98,2°. It’s not so much a problem of not enough illumination, but more that we are running on 3 or 3.5 cells, and we need ~4 to make the transmitters work. There may be some points during the orbit when the V gets high enough for the transmitter to come on at low power, but that is conjecture only. We don’t know when or really even if that will happen. If a cell opens up in the future, the IHU will immediately crash upon eclipse, and the battery voltage -may- rise to whatever the panels can provide. If this happens we may be able to restart the IHU and get a transmitter running, but it will only last until the next eclipse. Am 30.07.204, 0215UTC wurde der FM-Repater für eine 3-wöchige Testphase eingeschaltet. Die Leistung beträgt etwa 1W. Wer sich diese kurzen Mitschnitte einmal anhört, wird schnell feststellen, dass es schon schwierig ist, ein komplettes QSO zustande zu bringen. Beim Arbeiten über FM Satelliten gibt es gewisse Grundregeln, an die sich aber leider nur wenige halten. Die Geräuschkulisse ist sehr vielseitig, vom einfachen "Mitdrücken" bis zum "Ola, Ola"... Ein "Einpfeifen" ist auf den FM-Sats nicht notwenig! Es kann nur EINER über den Transponder arbeiten - und viele Leistung hilft hier nicht viel - Mit zuviel Leistung wird der Transponder zugestopft und niemand hat eine Chance mehr. Wichtig ist ZUHÖREN - Geduld üben. Wenn ein QSO läuft - abwarten. Dann kann man sich schon mal den Locator notieren und braucht dann vielleicht nicht noch einmal nachfragen! Es gibt (es gab bei UO-14 besonders viele...) Durchgänge, wo ich nur zuhöre, den Daumen am Mikrofon - aber dann nur den Kopf schüttle und nicht zu einem einzigen Anruf komme. Dann hat es eben nicht geklappt und ich muss wieder 100 Minuten warten, aber dann warte ich eben. So hatte vielleicht doch die eine oder andere Station das QSO ohne große Störungen zu beenden. Channel 0 - TX A Power:  UHF Transmitter A Output Power level. Channel 1 - TX B Power:  UHF Transmitter B Output Power level. Channel 3 -  Battery Voltage:  Voltage of the entire string of 6 battery cells. Channel 4 -  Cell 5 Voltage:  Voltage of the first 5 battery cells. Channel 5 -  Cell 4 Voltage:  Voltage of the first 4 battery cells. Channel 6 -  Cell 3 Voltage:  Voltage of the first 3 battery cells. Channel 7 -  Cell 2 Voltage:  Voltage of the first 2 battery cells. Channel 8 -  Cell 1 Voltage:  Voltage of the first battery cell. Channel 9 -  4.6 Volt Experiment Current:  Current reading on the 4.6 volt buss. Channel 10 - 4.6 Volt Experiment Voltage:  Voltage reading on the 4.6 volt buss. Channel 11 - 3.3 Volt Buss Current:  Current reading on the 3.3 volt buss. Channel 12 - 3.3 Volt Buss Voltage:  Voltage reading on the 3.3 volt buss. Channel 14 - Solar Array Voltage:  Total voltage output of the Solar Panel array subsystem. Channel 15 - +X Solar Panel Current:  Individual current reading from the +X Solar Panel. Channel 16 - -X Solar Panel Current:  Individual current reading from the -X Solar Panel. Channel 17 - +Y Solar Panel Current:  Individual current reading from the +Y Solar Panel. Channel 18 - -Y Solar Panel Current:  Individual current reading from the -Y Solar Panel. Channel 19 - +Z Solar Panel Current:  Individual current reading from the +Z Solar Panel. Channel 20 - - Z Solar Panel Current:  Individual current reading from the -Z Solar Panel. Channel 21 - +X Solar Panel Voltage:  Individual voltage reading from the +X Solar Panel. Channel 22 - -X Solar Panel Voltage:  Individual voltage reading from the -X Solar Panel. Channel 23 - +Y Solar Panel Voltage:  Individual voltage reading from the +Y Solar Panel. Channel 24 - -Y Solar Panel Voltage:  Individual voltage reading from the -Y Solar Panel. Channel 25 - +Z Solar Panel Voltage:  Individual voltage reading from the +Z Solar Panel. Channel 26 - -Z Solar Panel Voltage:  Individual voltage reading from the -Z Solar Panel. Channel 27 - Low Voltage Current:  Current for the SQRX receiver. Channel 28 - Battery Output Current:  Current output rate of the battery chain. Channel 29 - Transmitter Current:  Current drawn for all Transmitters combined. Channel 30 - Battery Sign:  Battery current position or negative sign. Channel 31 - SQRX RSSI:  The SQRX receiver's received signal strength. Channel 32 - SQRX Speaker:  Audio voltage of SQRX receiver. Channel 33 - Torque 1.2 Volt Reference:  Control voltage in the torque rod subsystem. Channel 34 - Torque Rod Magnetism Sense:  Amount of magnetism in the torque rod. located in the Integrated Flight Computer module. Channel 36 - S Band Temperature:  Temperature of the S Band Oscillator/Exciter module. located in the Transmitter Module, top module of the satellite stack. power feed to Transmitters. Units are volts. Channel 52 - PHT Time:  How often the Data broadcast messages are sent on the digital downlink. downlink. This is an integer multiplier of the PHT time. the battery voltage, various systems on the satellite will be shut down. A value of 0 will indicate no trip point has been reached. Channel 56 - WOD State:  Indicates the state of the WOD data collection system. A value of 0 indicates that WOD is Off. A 1 indicates that WOD is starting. A 2 indicates that WOD is currently running and collecting data. A 3 indicates that the WOD data collection is complete and stopped. Channel 57 - EDAC Error:  Count of the number of EDAC errors in Main Memory. Channel 58 - Reserved:  For future use. Channel 59 - Reserved:  For future use. Channel 60 - Reserved:  For future use. Channel 61 - Reserved:  For future use. Channel 62 - Reserved:  For future use. 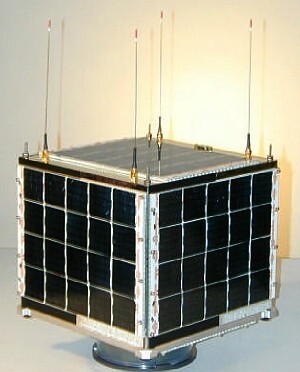 The BCR telemetry frame contains information about the battery system. These are the same raw values as in the TLMI frame for the specific channel. The satellite will send these frames even when TLMI frames are turned off. Therefore, the critical battery information may be monitored at all times. The frame is sent with the callsign 'BCR-1' and has the following format. battop:   Highest battery voltage observed since the Satellite software was loaded. Description and decoding same as Channel 3.
batlow:   Lowest battery voltage observed since the Satellite software was loaded. The values shown by the letters a thru i, will represent the raw telemetry channel value. The correct engineering coefficients will have to be applied to get a calibrated value. The labels represent the following telemetry channels, except for battop and batlow, which are special values calculated by the Echo control software onboard the satellite. Please see the Telemetry Channel Descriptions for details on each channel. Bei diesem (etwas ungewöhnlichem) Mode werden alle Signale aus dem Uplink in den FM-Kanal umgesetzt. Wenn eine Station in der Uplink-Frequenz daneben liegt, merkt man dies an der Tonhöhe. Der Uplink muss somit nachgeregelt und korrigiert werden. Es ist ein nettes Experiment, aber für den europäischen Bereich sicher nicht praktikabeler als ein FM-FM Transponder. Den oben angesprochenene Punkt zur Disziplin über FM Transponder will ich hier nicht noch einmal wiederholen.